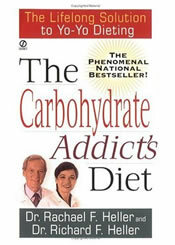 The Carbohydrate Addicts diet was written in 1993 by authors Rachel Heller MD, and Richard Heller MD. The success of the book has led to a number of follow-up books, many of which have been on bestseller lists. The premise behind the Carbohydrate Addicts Diet (CAD) is that most overweight people are addicted to carbohydrates. The Hellers’ claim that most people fail to metabolize carbohydrates correctly, causing an imbalance of insulin levels. The elevated insulin levels cause a craving for food throughout the day. Over the last few decades, refined sugars have played an increasing role in our diets. Authorities have esposed a low-fat diet – which has inadvertently lead to people eating far more carbohydrate than is necessary (given our generally sedentary lifestyles). It should be no surprise that many people have become accustomed to highly sweetened foods. Whether this qualifies as an addiction is up for debate. At its foundation is a reduction of carbohydrate intake. The rules are strict, with the diet providing a long list of foods, that are on the “allowed” list. Anything not in this list must be avoided. Each day is split into 2 main meals – 2 meals are made up of a protein source (fish, poultry, lean red meat) and fibrous vegetables. The 3rd meal is called the “reward” meal – this can be anything you want, but you should aim for a balance of 1/3 carbohydrate, 1/3 protein, and 1/3 fibrous (non-starchy vegetables). This reward meal must be consumed inside 1 hour. The diet begins with a restricted 2 week phase, but then goes into a variety of eating plans – depending on whether you are maintaining or losing more weight. The book does start with a set of questions to determine whether you are a “Carbohydrate Addict”. The questions will determine whether the diet is appropriate for you. Research over the last 5 years has shown considerable health benefits arising from moderating carbohydrate intake. However many find such diets difficult to sustain over the long term – much of our social eating patterns are based around carbohydrate foods. Many people have found success with this plan (as with many low-carbohydrate approaches). Proteins and fats often lead to a greater feeling of fullness – leading the dieter to consume less energy as compared with a high carbohydrate diet. Generally, we do eat too much processed carbohydrate (white flours, bakery foods, white rice and pasta, etc). This must surely be a contributor to obesity problems – but does not mean that all carbs are the enemy. See Also: Carbohydrate Addicts – Carbohydrate Addicts official home page. About the complimentary meal, it says about 4 ounces of protein and vegetables, but not all vegetables. It was strange to me that you could not have brocolli, nearly all diets let you have brocolli. No breading, on your meat until reward meal. I started it Monday. I had done it years ago. I am very strict on my Complimentary meals, but on my reward meal I don’t eat a salad like it says and I lost 5 lbs this week. I am completely satisfied. I don’t eat anything that is not sugarfree for a dessert, because I am used to it. I have had pizza, tamales and chilli, Popeye’s Chicken with potatoes. I have not had pizza in years. It is fun. Should the reward meal be consumed at the same time each day? For the complimentary meal, I’m confused about the portion sizes. Someone told me that I could only eat 4 carbs total during the two comp meals. Is this true? I went on the diet several years ago because my daughter in law lost so much weight on it. So did I. When I stopped I went on Adkins. Same results. I have tried to go on the Heller diet several times and cannot stick with it. Any suggestions for a second time around? Yes, you can have anything you want be the 1/3 carb protion. If you would like dessert go ahead. If you want baked pot. go ahead. Just make sure it is the same proportion to your vegi and protein and that you have two cups of salad. I’m so confused about that part. HELP!!! Did this about 15 months ago and in 4 months lost 45lbs. I then got pregnant..tried to still work the diet and only gained 21 lbs in my pregnancy. Since having baby I have been breast feeding and actually have gained 12 lbs since pre pregnancy weight. Been trying a couple of other diets thinking maybe they will work but I am going back to CAD. It is the only one that was EFFORTLESS and worked. I Lost about 35 lbs in about 6 months on the CAD. That was about 2 years ago. I started working selling Real Estate and it is so stressful I found myself eating from stress and went off the diet and gained most of the weight back. Honestly when I am off the diet I score the highest you can score on the Carbohydrate Addiction Test (embarrassing) and I am out of control. All I can think about is carbs. Even though when I am off the diet and I eat whatever I want nothing satisfies me. I feel hopeless and out of control. It’s awful. I bought their 7 day book and have started reading it. I am sooo sensitive to even a piece of sugar free gum or anything that is sweet even if it has low or no carbs. I need to eat more veges for sure and be more healthy this time. I love love love this diet. I can’t do any other diet which makes me feel like a loser but the books helped me understand that it is truly an addiction and it’s not my fault. I am so glad I have never tried drugs or alchohol because of this carb addiction I fear I might easily become addicted to those as well. I know the diet sounds crazy and I have had people make fun of me and think the diet can’t work but for me it’s absolutely the only diet that does work. I am sad that so many people are so close minded and won’t give it a chance because when you are following it, it’s the best of both worlds. Now when I do eat my Reward Meal I completely enjoy my food and am completely satisfied. Good Luck to everyone trying it and follow the diet to the T and read every word of the books because making up your own rules or modifying it in any way will make you gain or at least stop losing. You will not believe how great you can eat and still lose weight, feel good, happy, in control, and like there is hope. As a middle school teacher it was very strange for me to fall sound asleep during the middle of a 500 student school assembly, and not be able to bring myslf to. Being afraid that someone would think I was on drugs or something I immediately called my doctor and she suggested the Heller diet. I loved it! The weight just dropped off and I felt so much better. That was about 10 years ago. I fell off track and put on lots of weight… 30 pounds. I finally faithfully started the diet again, but have noticed that there’s a new 2010 version of the book. I’m not dropping the weight yet, but I feel so much better. When I’m tutoring about 2 hours after my lunch, I’m not falling asleep on the poor child. I feel more energized and in control. I would highly recommend this diet, especially if you love your breads! I did this diet back in the early 90’s. To answer a question about headaches and vomiting…this is your body’s reaction to taking away the sugar and carbs at random times of the day. Your body just has to acclimate to the changes. From what I remember, this is not “uncommon”. It’s like withdrawal symptoms (it’s an addicts withdrawal), I think they talk about this in their book?? Good luck to you, and I wouldn’t quit the diet, just find alternative ways to approach it until your body has finished its withdrawal. I personally had headaches from caffeine withdrawal, man – I was naseaus as could be too. I just started this way of eating a couple of days ago and already feeling very hopeful. My metabolism was stuck…stayed the same weight doing the Atkins diet so tried a low fat, 1300 calorie diet. Nuthin’! On Atkins, I’m bored..on low fat, I’m starving all day. CAD seems to be the answer to my prayers. I’m not bored because of the reward meal and I’m not hungry because of the high protein, good fats and low carb mini-meals. Have already dropped 4 lbs. Although I know that’s mostly water, at least the stupid scale is moving now and is encouraging. i love this diet.. thing is ive had side effects.. the first time i did it i couldnt believe my luck how great this diet was.. but day 6 i was throwing up and had migraines.. i assumed id caught a bug tht my son had but ended up comin off it as i felt ill.. 2 months later i did it again and on day 6 had terrible headcold and felt really ill.. i wonder if im dehydarted when iv done it and need to drink more water?? i love th diet and hope its just dehydrating cos its so easy.. both times i lost 5lbs in 1 wk and didnt feel deprived at all, felt great ..
Been doing the diet for ten days now and have only lost 1lb, is this normal? Oh and can you eat chewing gum? I went on this diet back in 2000 and lost about 40lbs which is what I needed to lose. I also exercised while doing this diet plan. Since then I have gained it all back…due to going off the diet plan. I am starting it again today and know I will have success. This is the only diet that has ever worked for me and the continual progress keeps me motivated. From a chocoholic’s perspective the reward meal is great. Going back on this Lifestyle Change today. Lost 35 Lbs I had gained when I became a Vegetarian. Little harder with no Fish Or Chicken though…It works! I am Happy that I found this site. I just re-started the plan today. I did it VERY successfully 5 years ago. Since then, I slowly started moving away from the principles and over the years have regained some weight. I was very encouraged to see so many comments from people with similar stories. I know that of all the food plans I have ever been on – this one worked the best for me. I am happy to be back at it and am looking forward to wearing my Spring clothes that haven’t fit for a while. I exercised for 30 min a day for almost a year & lost 5 pounds. I’m still exercising & now I’ve been on the diet for 2 wks (tomorrow), I’ve lost 7 pounds. I’m thrilled & I feel good. I’ve read the book & now been on the diet for 2 days. So far, so good. Lost 1 1/2 lbs so far. I think I can live with this. Day one, wasn’t hungry. Day two,.. hungry, but keep thinking… I get to EAT anything I want in 3 hours! I’m sure it’ll get easier in a few more days, but it’s nothing I can’t handle so far. It sounds as if it’s going to be a way of life & not a “diet”. I can live with that. Thank you for your objective article on this controversial diet plan. I, too have had great success with this diet, even though I chose to go off it after losing 65 pounds. (I was working two jobs and didn’t have time to shop and cook.) I am now back on, and despite a knee/back injury, am losing again more slowly but almost effortlessly. I’ve streamlined my shopping and cooking to make it easy for me to stay on track. I am the person who has to have the 6th piece of pizza (cold) at the office party, even though I was full at three. A box of doughnuts sitting next to the workplace coffee machine normally drives me crazy; I keep thinking about it, craving a doughnut I neither need nor really want. Now that I am back on the plan, I literally have a plate of cookies within arm’s reach all day long at work and barely notice it. That’s a diet I can stick for however long it takes to get to my size 10 or so. At first I ate huge portions, and still lost. But then I found I wanted smaller portions. I don’t need quite as much butter on my vegies. I even skip a meal now and again! Because my preferred carbs are still desserts, I take vitamins especially B-vitamin complex. Food shopping is a pleasure, as I plan my delicious meals including dessert. I happen to adore vegetables which is a plus. This diet plan is the closest thing I have found to the ideal of eating without the feelings of deprivation, hunger, and intense craving. Watch out for MSG and high fructose corn syrup. I have found as the Hellers point out that msg (and for me high fructose corn syrup) causes me to crave the foods containing them. I ate some supposedly msg free Chinese food, and spent the next 8 or so hours, like an addict in cold turkey withdrawl. I was so angry at the restaurant, I used my anger to get me through it and not give in and eat what my fullness told me wasn’t real hunger. I really suffered, but at least thanks to the Hellers, I knew what was happening to me. Now losing weight is happening to me, and I’m starting to take an interest in whole wheat pasta for my carb selection, with a little spaghetti sauce and parmesan cheese on it–yum yum. I was on this diet, 10 years ago. It was the best diet I every tried. Even though I was a first time dieter, this diet made me feel like this was a normal lifestyle with discipline about eating. I lost 30 pounds in 6 months. I stayed on the diet for 3 years, my choice, I lost too much weight though. Even at work I had many people noticing the weight I was losing and ask about what was I’m doing because they can see the transformation. Even my husband who teased me about the reward, how much food and junk food I was eating and still losing weight! We all did the diet,and my co-workers lost 20-30 pounds without exercising. Even after 3 years I gave it up, because I got too skinny that I slip through this crack on the floor at work, all the way up to my thighs, thats when I knew I went too far. After that my friends confess that I was looking bony. ( I even lost my @ss!!). Now 10 years later, I finally put the weight back on and thinking about doing the diet again. I don’t know. But for the naysayers this diet does work more naturally with out feeling deprived. Thank you doctors!! I love this diet! I was on this diet/lifestyle for almost 2 years. I went from a size 12 to a size 4. However, I got sick and my doc perscribed a seriod and now I am back to size 12. I know I needed the medication to get better but man it feels like I am starting all over. All my “little” clothes are in the back of the closet now. So here I am starting at the begining again… sigh. I lost about 20 lbs painlessly, years ago. I could eat normal,and I was satisfied. Then I got side tracked, and my reward meal became a binge meal. I believe it is truth, and a lifetime program, to be able to eat and be satisfied. It takes a little effort, but it is a whole lot easier than small meals, that just leave you hungier than when you started. I am on day 5 of the Carb Addicts Diet and I feel great! I am usually exhausted by lunch time and desperate for a nap. But for the last 4 days I have had more energy than I have had in a really long time. I am not hungry. I enjoy my meals, and if I craze sweets, I can put it off because I know that I can have something small for supper. I have lost 2 lbs. so far, and my weight doesn’t seem to be fluctuating as much day to day as it did on the carbs. I believe this may be the diet that can finally change me and that I can follow long term. Jackie, if you see this reply, there are no phases, it’s really simple and I disagree with the review about the long lists etc, it’s actually simpler than that. Treat yourself to the book and you won’t regret it.. I used this ten years ago to stop a cycle of binge-eating after I went through a tough patch, and I’m back on it after getting careless. This works, and is much healthier than Atkins because you do get to eat carbs, just not grazing all day on them like the typical diet tells you to do. I think I may be able to do this one. I must do something and it seems almost impossible for me to lose weight. This is the easiest and the best diet I have ever been.Highly recommended.I was a carb junkie. This diet has really helped me control those cravings and my yo yo weight. Just starting diet. Heard about this diet from a friend and her husband. Both husband and wife say this diet works great and they recommend it. So, hopefully in a couple of weeks I will be able to get on here and have some great news about how many pounds I have lost following this diet. I tried this years ago,lost 20lbs.I am back on it again and am never hungry.I realize I love carbs but I can have some in the reward meal so it is something to look forward to. I lost about 50lbs in 3 months on this diet. i went on vacation and ate what i wanted and still ended up losing about 10 more pounds. i just had twins and so i’ve gained a ton of weight….getting ready to start again. I’ll admit the first couple of weeks were difficult. I almost quit several times, but once you get past that beginner’s hump the weight starts to literally FLY/MELT, whatever you want to call it, off. Then, once people start noticing and giving you compliments it’s like someone lights a fire in the machine. Thats the way it was for me anyways and I was hooked. I’m definitely excited to be starting it again. 😉 GOOD LUCK!! The Carbohydrate Addicts diet works really does reduce food cravings. How can you argue with a diet that encourages people to eat low fat protein, healthy fats and veggies? The “cheat meal” sounds like a gimmick, and it is, but it also allows dieters to have SOME lush carbs like cake or pie, provided they eat a healthy meal FIRST and limit their splurges to once a day. For many people, that will be a HUGE improvement. i’ve had weight probs all my life, until a friend sent me r & r hellers’ carb addicts diet book within 9 mos, i went frm sz22 dwn to sz 6.. in ano 2 mos i was sz 1-2 & kept it off 9 yrs, til my stupid shrink presc’d meds that causd weight-gain & in less than 6 wks i was back to a sz 8, & now a sz 12. i’ve lookd for a copy of this book snc 2001. it’s the only diet that’s ever wkd for me. based on what was given i thiink i may be able to work with that….i LOVE CARBS!!! !